Just a quicky before I head off. Thats cool. The background is neat too. Weeee! Shiny alien guys! And he's BLUE! 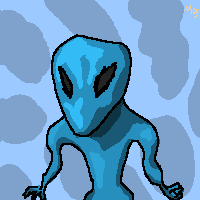 I loooove Shiny blue alien guys! He looks slippery, too. ^-^ I'd bet the light effect would make him look cool, too.